« College admissions scandal: Much ado about nothing? The Council for Aid to Education reports that 4 in 10 U.S. college students graduate without the complex reasoning skills to manage white-collar work. 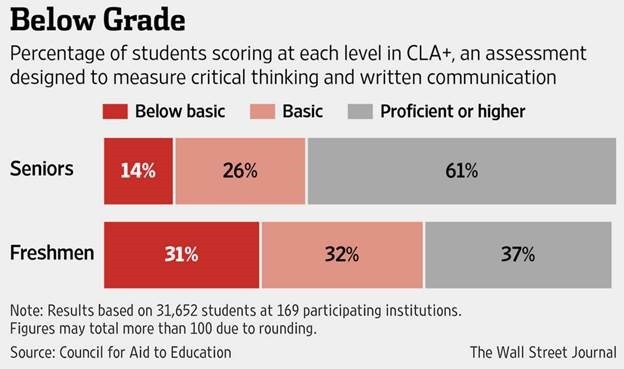 CAE broadly administers a test that doesn’t cover subject-area knowledge, but rather assesses “highly transferrable skills” like critical thinking, analytical reasoning, document literacy, writing and communication—essentially evaluating the baseline requirements for “professionals”. The 40% of students who didn’t meet a standard deemed “proficient” were unable to read a scatter plot, construct a cohesive argument or identify a logical fallacy. This entry was posted on March 26, 2019 at 6:59 am and is filed under Uncategorized. You can follow any responses to this entry through the RSS 2.0 feed. You can leave a response, or trackback from your own site.